The molecules of a soft lead pencil and the clear hard diamond are both different forms of the element carbon. The organization of the atoms determines their properties. Notice the covalent bonds in the 3D model of the diamond in the image on the left. Covalent bond means that shared electrons "belong" to both atoms, and in this process create a bond between atoms. The interlocking strength, with each carbon atom bonding to four others, forms a stable and very hard "molecule" consisting of millions of atoms. 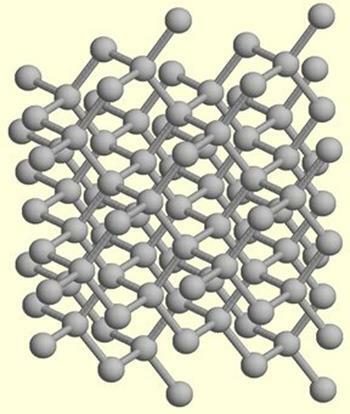 Now notice above the atoms lined up in the graphite (lead) to the right of the diamond molecule. 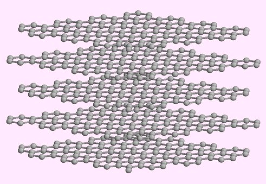 In the horizontal direction, the bonds form a strong structure, but in the vertical direction between the planes, the bonds are weak and allow the graphite to be soft and slippery blankets of atoms. We have established that the different states of matter (gases, liquids, solids, and plasma) are composed of the same atoms but can have very different properties based on their organization. If we think of the different states of matter that water can assume, we gain an intuitive understanding of how the organization of matter would give each state different properties. 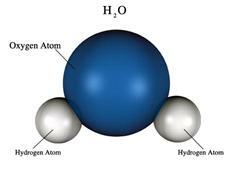 In solid water (ice) we have atoms bound tightly together. In liquids (water) the molecules are able to slide over each other and fill empty volumes. They stick together (though not tightly), which is why liquid water beads up on glass surfaces. Water is also the universal solvent, and almost all substances necessary to life can be dissolved in water. Our cells are also mostly water enclosed in membranes. In the gas (steam) the molecules freely expand, filling space because of their high energy. If we magnify steam or another gas millions of times, it would appear as trillions of individual rubber super balls bouncing off each other. An atom in an element generally contains an equal number of electrons and protons. At the center of the atom is the nucleus, composed of neutrons and protons, which can be visualized as a bunch of super-tiny balls clumped tightly together in a spherical form with planet-like electron orbitals surrounding them. Electrons carry a negative charge numerically equal to that of protons and orbit the nuclei of atoms in shells. Their mass is about 1/1836 the mass of a proton. 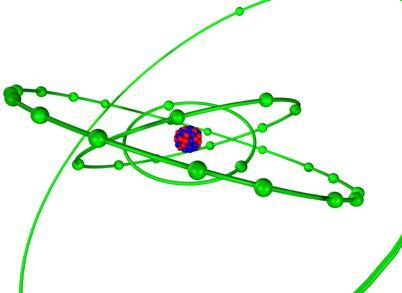 The nucleus is a very small structure, about 1/10,000 the radius of an individual atom. Indeed, the atom is an empty space between the nucleus and the outer electrons in orbit around the nucleus. Protons are positively charged particles found in the nuclei of all atoms and have a mass similar to that of neutrons. Neutrons are uncharged particles found in the nuclei of all known atoms but hydrogen. The nucleus is also much bigger than the electron and the electron has a fraction of the mass. The nucleus weighs about 1860 times more than the electron. The relative mass of proton vs. electron. In both elements and compounds, electrons attracted to the positive nucleus of the atom function as electrostatic glue, holding atoms together in complex molecules.